The act of writing is one of expression as much as it is an act of creation. An author finds something within him- or herself that feels worthy of saying or investigating and then spends hours, months, years delving into and perfecting that expression. At the end readers like to think we see the author in the finished work, but sometimes it’s difficult to tell what’s polish and what’s raw glimpses of the author. With A Breath of Life by Clarice Lispector, the mystery of author remains, but even as we ponder who she was and what of her remains in the work, she gives us a surface story to contemplate. In fact the entire book is a meditation on authorship and what it means to create and we readers watch Author (a male character) struggle to give life to (and to control and also to free) his character, Angela. It is a struggle that will be familiar to anyone who has ever created a character and this story reveals more about why and how we create than any plot about a writer ever could. Are our characters part of ourselves? Are the opposites we explore through writing because we cannot, will not live their way in life? Or are they some hybrid on which we work out those inner struggles? The answer is probably different for all writers, but I’d imagine that it includes some measure of all three. I don’t know how familiar this push-pull between writer and character is to other writers, but for me it brought back so many memories of writing Magda in Polska, 1994. A young girl of my age but a different nationality than me, the only year we experienced of her life is one that I too experienced in Poland. I remember poring over my diaries from that year for pertinent historical details to include, and at times some of my own angst and experience slipped in. But there were times, too, that Magda surprised me—even shocked me with things I would never dare say. As I wrote, she became her own person. And though I still tried to control her at times, she would not let me and I learned from her. Writing: Raising Ourselves or Parenting? I’m thinking a lot about creation of character these days, but from a completely different angle. I’m trying to imagine who this fetus growing in my womb will become. My husband and I are dreaming of activities and names for him, and we’re trying to maintain a space around him too to see who he will want to be. Still, I imagine some of the struggle with raising a child will be some of the same struggle I had with Magda. As creator (and adult), I think I know best, but I will have to remain open to letting this little guy determine who he is and how he sees the world. I will have to resist telling him how it is because that closes him and me off to the opportunity of me learning from him. And I will have to restrain myself from putting my baggage onto him because he’ll have his own struggles and his own life and it’s up to me to work out mine in my own space. I imagine this teeter-totter of shaping a child and allowing him to become is something I’ll struggle with for the rest of my life, but I’m glad I’ve had this perspective of the wonder of seeing a character become herself to look back on and remember the joy that can happen when I loosen my control. In many ways A Breath of Life is about the act of writing more than it is a story. Lispector was dying as she wrote it (and in fact died before it was finished) so we’ll never know if the book was truly meant to be seen in this form. But I love the rawness of the struggle Author goes through both with Angela and with himself. Like most of us, he sometimes hates writing. He’s digging inside of it to see why he even does this to himself. And yet he doesn’t stop. And it’s easy to wonder if Lispector would have gone back and rewritten Angela once she had worked through this kind of information on the page. I would have. Most people would have. But I’m very glad she didn’t, because I really enjoyed seeing her process, even if I cannot know the sequence of it. Because of that rawness, this is not a book I’d recommend to most people, but if you’re a lonely writer toiling away in your garret and wondering how others do, it’s a great book. You may see yourself in it, you may not, but it will make you think more deeply about your craft and about the act of writing. It’s been easy to assume throughout this pregnancy that I feel wonky because of hormones and this totally new experience that’s changing my relationships and my whole life. But I realized the other day that I’d given up an essential part of myself along the way. I stopped reading fiction that challenged me. I was reading through discards on my to-read shelf that were only okay and I spent more hours reading nonfiction about labor and delivery than I’ll ever spend in labor, but I wasn’t reading Lispector and Calvino and Pamuk (or any of the other favorites old and new). And I didn’t see, until they were missing from my life, how much books like that help me process the world. We’ve probably all seen the articles on the internet about how reading fiction helps us empathize. It wasn’t until two friends posted an article about 11 novels expectant parents should read instead of parenting books that I understood how much I need space to process. I don’t need a parenting book to tell me that my baby will try and communicate with me to tell me he’s hungry. I need to see an illustration of the relationship that happens when a child’s needs aren’t met. I will not remember any of the words I read about breathing or birthing positions, but reading Edan Lepucki’s California profoundly affected my idea of what birth means. Thanks for reading. If you have a moment, I’d love to hear your thoughts on controlling characters and letting them go (whether the characters are on paper or in your home). 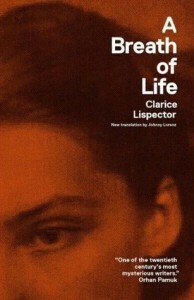 If you want to commune with Lispector by reading A Breath of Life, pick up a copy from Powell’s Books. Your purchase keeps indie booksellers in business and I receive a commission. Hope your re-created site suits and serves you well, Isla.